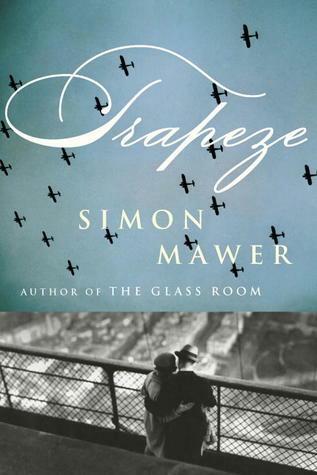 Simon Mawer’s new novel, titled The Girl Who Fell from the Sky in the UK and Trapeze in the US, is the story of Marian Sutro (aka Anne-Marie Laroche, Alice Thurrock, and Laurence Aimee Follette), a British agent in France during World War II. Her official assignment is in the southwestern countryside, near Toulouse, where she works as a courier, taking messages to allies in the area towns. But she also has an unofficial assignment, to get to Paris and convince Clément, a family friend and Marian’s own lost love, to leave France and bring his scientific expertise to England, where he can help in the building of a nuclear bomb. Cautiously she starts sending out her call sign, the hesitant dots and dashes vanishing into the wilderness of the evening like faint birdsong. In Brest and Augsberg and Nuremberg receiver stations will have detected that little flutter on the airwaves. Phones will be ringing, one station calling the other while their directional ariels will be shifting round the compass to nose out the bearing of this fragile new intruder. Lines will be drawn on a map of Europe, to intersect in a triangle over the city of Paris … and meanwhile in a country house in southern England, that manor house at Grendon Underwood, a FANY wireless operator may or may not be listening, may or may not be crying out, “It’s Alice!” and calling her supervisor over and putting her hand on her Morse key to tap out a response. The writing is good, and I was in suspense until the very last page. Plus, Mawer does some interesting things with Marian’s status as a spy. Her many identities come to represent her own identity development. What sort of woman is she? What sort of woman does she want to be? Can she–should she–break free from past attachments and set her own course? Is she Marian, Anne-Marie, or Alice? All of this questioning is rolled into her mission to convince Clément to return to France and her relationship with a new man, a fellow agent named Benoît. So all of this should be enough, no? For many readers, it will be, and understandably so. It’s an enjoyable book. But a few things niggled at me almost from the start, and I simply couldn’t let go of these problems and just give myself over to the pleasure of a good story. The first problem is that the whole plot hinged on Marian’s revealing her assignment in France to her brother Ned almost from the moment she is recruited and told specifically not to tell anyone, including Ned, anything. Ned, a scientist and friend of Clément, goes and blabs to his superiors, and the next thing you know, some mysterious British authorities are giving her this additional assignment to retrieve Clément even though they know for a fact that she is a security risk. Perhaps it’s my recent MI-5/Spooks binge, but I just couldn’t get past such blatant disregard for security. What makes all this even more annoying is that there are hints later that she might have been selected for the French assignment because of her known connection with Clément, so the security breaches that caused me to lose respect for her as a spy weren’t even necessary to make the plot work. Marian’s security breach was just the first of several reasons I didn’t find her convincing as a spy. She is skilled at spycraft. She’s a crack shot and excels at her training. When she’s in Paris, she’s suitably paranoid and goes to extreme measures to hide forbidden objects in her person. But I didn’t believe in her commitment to the cause. Early on, she accepts the post because of the challenge and the adrenaline rush, not necessarily out of patriotism, and I can buy that. Surely not everyone who takes huge risks for their country is an all-out, no-holds-barred patriot. But the amount of thought she gives to the greater good is remarkably small, especially when compared to how much she dwells upon Clément and Benoît. Most of the time, she’s thinking either about moment-to-moment survival, which I can understand fully, or about the man she wants to be with, which I can understand up to a point. She gives passing thoughts to wanting to save France and to whether the people giving her orders are entirely trust-worthy, but they’re little more than passing thoughts. Marian’s romantic quandary is front and center, and it’s the least interesting thing about the book. And inasmuch as I’m reading with a feminist lens, I find this emphasis problematic, as if Marian’s identity can be reduced to which man she chooses. There were so many missed opportunities for other ideas to explore or additional intrigue to keep readers guessing, but the romance kept intruding. This book could have been great, really great, but it falls short. I suspect that I wouldn’t have been so alert of Marian’s potential flaws as a spy were it not for her early oversharing, but that early loss of respect tainted the whole reading, and the more I think about this book the more exasperated I get. I was one of the few people who merely liked but didn’t love The Glass Room, Mawer’s previous book. so it may just be that he and I are a bad match and others will like this better. Jackie at Farm Lane Books posted a glowing review yesterday, and I’m sure there will be more. It wasn’t for me, but perhaps it will be for you. It’s not all that soppy really. I just wanted to see other motivations than romance to come into play more than they did. I wasn’t convinced that someone would risk her life for these particular relationships without some other motivation. I’m sorry to hear this one didn’t work for you. When I first heard about this one, it sounded like it had great promise: the premise seemed intriguing, and I’d heard such good things about Mawer’s last novel. I may still give it a go at some point, but I’ll keep your criticisms in mind. In reading your issues with the actual espionage execution in this book, I was reminded of my days when I would watch Alias. I loved that show and it knew how to do a cliffhanger like nobody else, but at least once per episode I would loudly decry Sidney Bristow as quite possibly the worst spy ever! Oh gosh, so many plot holes and so much infuriating behavior on Alias! I mostly watched for Victor Garber. So much awesome intensity! And if the premise appeals, give this a try. It’s not a terrible book; I just couldn’t put my annoyances aside. I read somewhere that the title change for the US was because of the other book. I kind of like the UK title–Trapeze just doesn’t say much–but I hear what you’re saying about “The Girl…” titles. I mostly think of The Girl with the Dragon Tattoo, etc., and this book is not in the same family as those at all! Interesting perspective! I hadn’t even noticed the potential security breaches until you mentioned them, but I’m not that knowledgeable about spies. Even in thinking about them I don`t see them as too serious. Telling a family member is very different to telling a German. Her unique links would have overridden that small leak – it isn’t as though there were lots of other people who could do the job. I take your point about focusing on the relationships, but I think the majority of women her age would have a similar focus. I found her thoughtscompelling and i don’t think I`d have enjoyed the book you suggest as much as I did this one. It sounds as though Mawer is just writing more to my taste than yours. I don’t know much about spies either, but I just finished an MI-5/Spooks binge, and secrecy was huge, huge, huge, and the early mention of the Official Secrets Act, which comes up a lot on Spooks, but it in my mind. In the book, Marian was directly told not to tell her brother, so it bothered me that she did in the next chapter and then he went and shared what he knew with his colleagues. One of them could have been a spy for Germany, which is what I kept expecting to happen! I do agree that her unique links were crucial to the mission, but it would have worked better for me if she had just been recruited for that reason and if Ned had been part of that. I loved The Glass Room and can hardly believe the same author wrote this shallow book. The story of the SOE is much better told in other books. I think he needs to take a rest from writing and build up his batteries. Really flat characters, kind of stupid really. Might be a good read for a 15 year old. I just read this and felt similar to you, especially the security breaches. That made me crazy. I, however, really liked The Glass Room. I agree with Christine’s comment. Very shallow compared to TGR.